One of the major causes of click loss is speed, or rather the lack of it. I've written many times about some of the ways to speed up your redirects and landing pages, so today I'd like to focus on 3 things I recently implemented on the Prosper202 home page that resulted in a 3-5x speedup in the page load. The most invaluable tool during this whole process was my Chrome/Safari developer tools view. This showed me exactly how long the page was taking to load and which elements were slowing down my page. The easiest way to get to this is to right click on your page and click inspect element in the context menu. The easiest thing to do when speeding up your pages is to remove unnecessary content and elements from your pages. These could be widget, images, text, etc. For me one of the slower widgets on the page was the Facebook like button. I removed this and immediately saw a boost in load times. 3rd party widgets can often slow down your page if they are not optimized. Also a lot of thine due to the number of people loading up the widgets the performance can be reduced by quite a bit. It makes sense that if your files are smaller, they will download faster. I had two css files on the page that I compressed. Another optimization that I could have done was to combine the two css files into one. This would save the browser from having to make two connections to download the css files. For my optimization, I uploaded all the newly compressed css files to the CDN. Additionally I also uploaded my images to the CDN. Also remember how I mentioned that 3rd party widgets are sometimes the biggest culprits for slow loading pages? Well one trick I used was to move the contents of some of these 3rd party widgets onto my CDN server. This made it so the even though the original files was slow I wasn't dependent on it any more. The one thing to be careful of when using this technique is that you will have to keep an eye on the original JS from the provider. If they change the code, it would be up to you to see this and update the files on your CDN. The final results after doing all these was a huge difference in page load speeds. When everything is cached a the page can load in under 700ms. On average the page will load in 1-1.7 seconds. Sometimes its a little slower due to 3rd party content that I was able to remove or optimize based on how they were implemented. 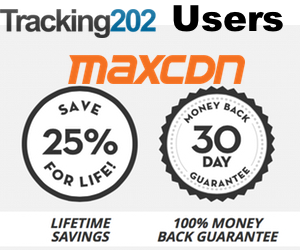 MaxCDN is one of the top CDN providers out there. I know a lot of affiliates use them already and they understand the needs of digital marketers. I reached out to them to secure a pretty awesome deal for all Prosper202 and Tracking202 users. So when you search the internet you will see there are a lot of 20% off coupons out there. I've managed to get them to give us a 25% discount for your MAxCDN account. I hope you find this post helpful and if you have any questions or cools suggestions on how to improve some of the tips I covered I'd love to read your comments about it.